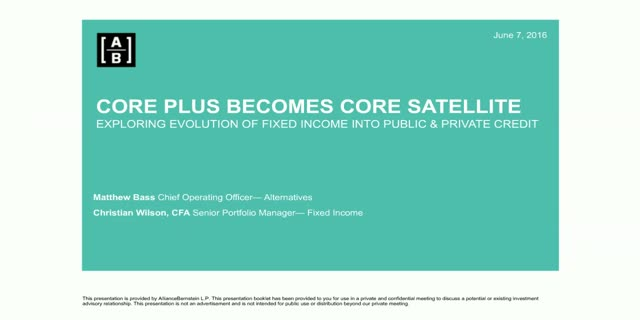 We’re going take a fresh dive into fixed-income investing, focusing specifically on the latest evolution in core plus strategies.So what’s fresh? Plenty. Investor interest in high yielding public and private credit markets is rocketing, transforming classic core plus strategies. In turn, knowing what framework to apply in allocating to these satellite strategies, while considering the volatility of public markets and lower liquidity of private credit, is crucial. II's Duncan Kerr and featured speakers – Matthew Bass, Chief Operating Officer of AB’s alternatives business, and Christian Wilson, Fixed Income Senior Portfolio Manager – will help guide you through this.